Academics deal with thousands of reference files (text documents, data sheets, images), which are sent by email, downloaded from the Internet, or obtained in other ways. To use MacPowerUsers‘ terms, ‘gathering’ of these files in neat hierarchical folders is not an option, the only viable strategy in the modern jungle of academic information is ‘hunting’ for the relevant content when you need it. This entry updates three posts on organizing reference files written about six months ago. A typical example of a reference file is an article a colleague sends you by email … ‘for your reference’. It may be useful for some of your learning, teaching or writing projects now or in the future but you typically don’t know which ones. That’s one of the reason there is usually no project folder on your computer where the reference file can be conveniently stored. Thus you have to find an easy automatic way to name, tag and save the file so that you can easily find it when needed. 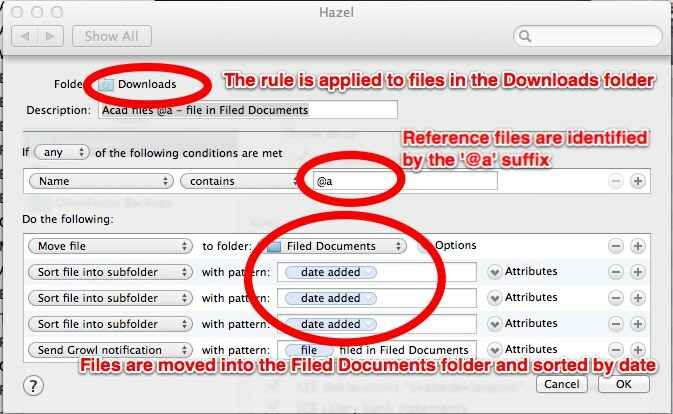 The first of my posts on reference files concerns the naming system which I still use: ‘Author-Year-Title’ followed by “@a” (for “academic”) used for automatic filing by Hazel. This system worked really well for me because it was easy to choose the name and the filing by Hazel has worked very smoothly. The two other posts described tagging and storing reference files and I need to clarify and update them. First, I found that the easiest, the quickest and the least disruptive way of tagging files is through DefaultFolderX. The advantage of this approach is that the tagging takes place when you are saving the files and thus, with very little discipline, you can make sure that all your reference files are tagged. No other software needs to get opened and distract you from doing your work. I have also discovered the elegance and usefulness of the OpenMeta tagging system where the same tags are used by different software ranging from simple Notational Velocity to advanced DevonThink. 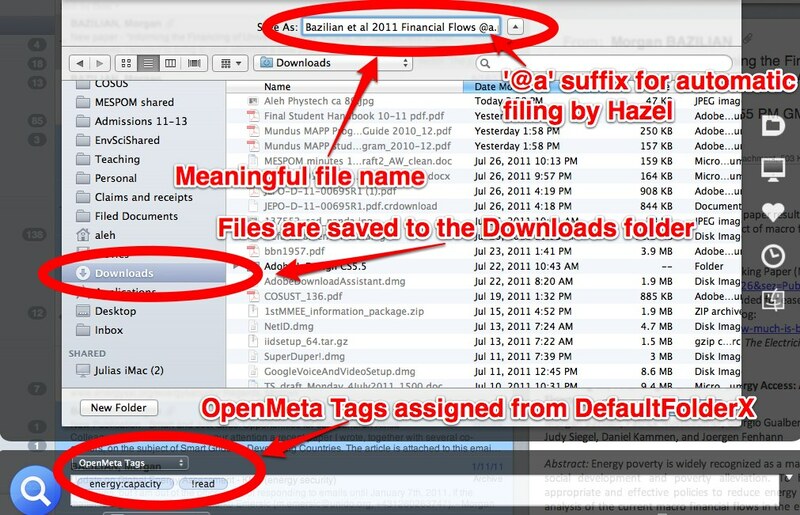 DefaultFolderX supports OpenMeta tagging compatible with a large and increasing number of applications. Over time, I try to gradually adjust the tagging system to fit my own way of remembering ‘where things are’. My final remark concerns scientific articles and other documents which need to be imported into bibliography managers (such as Papers, Sente, EndNote or Bookends) to be subsequently cited. I found that the process of such importing (which includes matching the file with its bibliographic data) is too disruptive in most situations when I want to name, tag and save the file as quickly and as thoughtlessly as possible and get on with my work. Exceptions are situations when I am already in the middle of a writing project and I download a file specifically to be referenced in my publication. Then it makes sense to import the document into the bibliographic software immediately after downloading. Even in such cases I still first use the normal routines for naming and tagging the file and only then import it into the bibliography software. 1) Reference files are saved in the Downloads folder with a meaningful name (preferably Author-Date-Title) followed by the “@a” suffix. While saving, the files are tagged by DefaultFolderX (see picture). The rule of thumb for tagging is to think how you will look for the file one year from now. 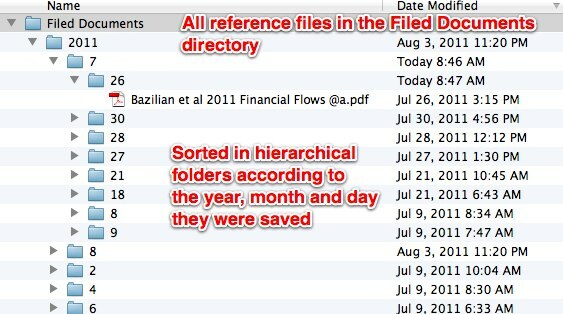 The question you might want to ask is ‘how do I find the reference files organized this way?’ The short answer is that there is a large number of apps designed for this purpose from Mac’s native Spotlight and very simple Tags to more advanced HoudahSpot, Leap and eventually very complex DevonThink. The long answer is in the next Macademic post. Meanwhile, enjoy the Summer! This entry was posted in Automation, Files, Tags and folders and tagged DefaultFolderX, DevonThink, Hazel, OpenMeta. Bookmark the permalink. I appreciate you writing all this! I’m confused by one thing – why do you sort your papers into folders by date added? Doesn’t the file’s Created Date field provide the same functionality?